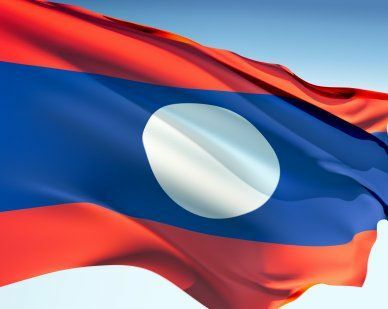 The Laotian flag is based on the Lao Patriotic Front, also known as the Pathet Lao. The Pathet Lao movement was a communist national movement that was established to fight for Laotian independence. In 1975 the Pathet Lao movement took control and removed the monarchy in favor of communism. The Laotian flag was adopted in 1975. It is one of the few communist flags that doesn't feature a star. The red stripe signifies bloodshed in the fight for independence. The blue stripe stands for wealth and prosperity while the white stripe symbolizes justice and unity. Our top-quality Laos flags conform to all official specifications. Emblems and designs are executed with the highest possible degree of accuracy in regard to detail, color shades, placement and proportion to flag size.